For those of you who don't already know, Kraftwerk are a German synth act who have often been described as the Godfathers of electronic music. They often sing their vocals through a vocoder, or use computer-generated vocals. Of course, there are plenty of critics who simply don't understand the minimalist, emotionless, robotic sound, but this was exactly what Kraftwerk were trying to achieve. They were not interested in the big productions and excessive reverb that many other 70s and 80s acts relied upon. 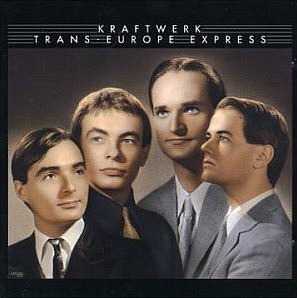 Formed in 1970, the name Kraftwerk is German for "Power Plant". The quartet's first hit single in the UK was "Autobahn" which reached #11 in 1975. The band had to wait until the 80s for their next hit, though. In 1981 their "Pocket Calculator" single managed to just break into the Top 40, peaking at #39. This was the first track to be released from the album Computer World. 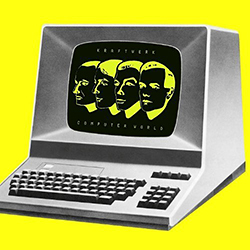 The cover from the Computer World album (2009 re-master). The original album was released in 1981. For the rest of this page, I'm going to take a look back at some of the group's single releases from the 70s and 80s. Almost all of the Kraftwerk's singles can be played in the video playlist above. Released in 1975, This was the title track from Kraftwerk's fourth studio album and reached #11 in the UK and #25 in the U.S. Not only was this the band's first chart hit, but it was also their first track to feature vocals. The Autobahn album was a top five hit in the UK, U.S. and Canada and the title track last for 22 minutes. This was, obviously, shortened considerably for the single release. The album isn't 100% electronic and actually features a violin, flute and guitar. 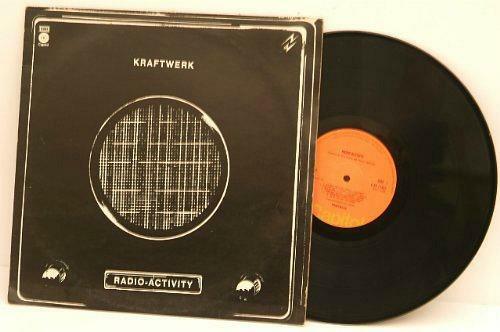 Radioactivity is a regular feature at Kraftwerk's live concerts and was originally released in 1976 as the only single from the 1975 album Radio-Activity. The song topped the charts in France, but wasn't a hit in the UK. The previous single Autobahn - this was the title track from the band's debut album - had reached #11 in the UK and #25 in the U.S. Radioactivity was remixed an re-released in 1991 as the second track from the remix album The Mix and reached #43 in the UK. A new version of The Robots was also re-released prior to this to promote the album and reached #20. 1991 singl with A-side remixed by Francois Kevorkian and B-side remixed by William Orbit. The Trans-Europe Express video featured an extravagant train journey which used as a press conference by EMI France. The track was the lead single and title track from the band's third album (released in 1977) but failed to chart in the UK, although it was a minor hit in some European countries. Two more singles were released from the album which were Showroom Dummies, the only hit single from the album in the British singles chart reaching #25, and Europe Endless. This is one of my favourite Kraftwerk tracks, and the sound is just Kraftwerk at their finest. 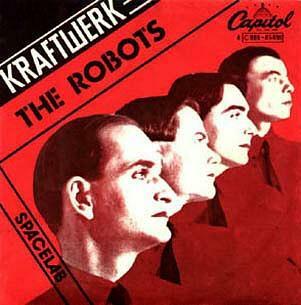 "Die Roboter" was released as a 7 inch single in 1978, with Spacelab featuring on the B-side. Full length versions of both tracks were included on the album The Man-Machine. The single reached #25 in Germany, #23 in Austria and #47 in Italy. It did not chart in the UK, although I'm not entirely sure whether it was released here. A re-recorded and re-arranged version of The Robots was released as a 7", 12" and CD single in 1991, with the full version appearing on the album The Mix. The single reached #20 in the UK, #18 in Germany and #26 in Ireland. Whether the new arrangement was an improvement on the original track is up for debate, although I do actually prefer it. The Mix album featured re-recorded versions of previous songs, and met with a mixed reception by the critics. I bought the album on CD and thoroughly enjoyed listening to it, although I had never bought any of Kraftwerk's previous albums containing the original versions of the tracks. Many fans and critics were disappointed with the lack of new compositions, and argued that the digital tracks didn't have the "warmth" of the original analogue recordings. However, as Kraftwerk's musical style is supposed to sound clinical and sterile, I feel that the digital age is well-suited to their sound. Neon Lights is from the 1978 album The Man-Machine, which also featured the No.1 single The Model. Neon Lights has been covered by Simple Minds, OMD and U2. The song failed to break the UK Top 40, peaking at #53. Quite surprising considering that the previous single, The Model, had topped the UK charts and this was a decent tune. 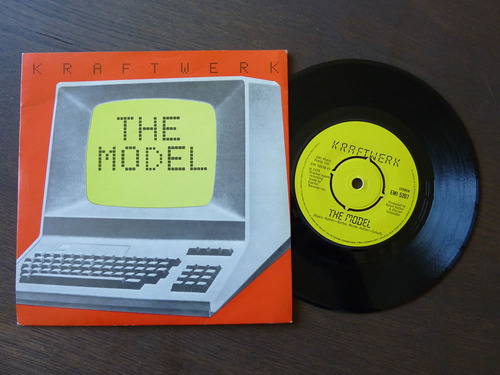 The group's best-known single, The Model, was taken from The Man-Machine, which was the fourth studio album by Kraftwerk and originally released in 1978. The song was originally released as a B-side to Computer Love which reached #36 in 1981. However, DJ's decided to start playing The Model instead of the A-side Computer Love, and this led EMI to re-release the single in December 1981 with The Model as the A-side, which was, apparantly, against the band's wishes. The Model reached #1 in February 1982 (four years after the original release of the Man Machine album!) and stayed inside the Top 75 for 21 weeks. Featuring a combination of mechanical and vocal sounds and samples, and an electro drum/percussion beat, the original release of Tour De France (June 1983) reached #22 in the UK and #47 in the band's home country of Germany. The breakdance remix was released in August 1984 and peaked at #24 in the UK, but did well on the US Hot Dance Music/Club Play Chart reaching #4. A completely new recording of the Tour De France album was issued in 2003 and was based on the original 1983 album. A re-release of the single in 1999 failed to break the Top 40, stalling at #61 in the UK singles chart. 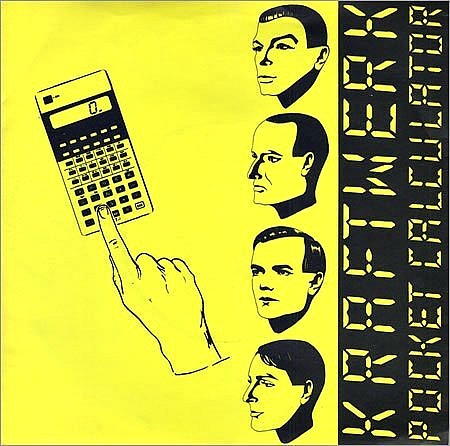 Pocket Calculator reached #39 in the UK in 1981 and was Kraftwerk's first track to be released from the album Computer World. It was their second Top 40 single - In 1975 the quartet reached the Top 40 with Autobahn, which reached #11. Now before you get confused, this video features the German electronica band performing Pocket Calculator in Italian. Actually, it works really well in Italian! Released in February 1987, this track was Kraftwerk's second single from the album Electric Cafe and reached #89 in the UK, although it topped the Dance Charts for two weeks. The B-side featured the track House Phone which also appeared on the 2009 remaster of Electric Cafe, although it did not appear on the earlier 2004 reissue. 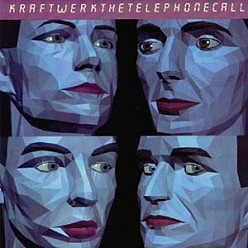 The album itself was not commercially successful and The Telephone Call would be the quartet's last single release of the 80s - previously, Musique Non Stop had reached #82. There were only six tracks on the original album which had a very typical minimalist sound, with electronic synthetic sounds and computer generated voices that are completely devoid of any emotion, which is what they were setting-out to achieve, of course. The main problem, however, was that there was nothing really new here, and many critics argued that there was a lack of focus on the album, with no real stand-out track and the band not knowing quite which direction they were taking. But it has many fans, and what Kraftwerk do best is not try to be too clever and keeping everything simple, not adding too many layers, and allowing each part of the song to be clearly heard. This was starting to sound dated (at the time!) with many other artists using up-to-date or over-the-top production techniques in their work, and so the critics were expecting more. Whether the German group had run out of ideas, or were simply sticking to what they know will always be up for debate, but I admire them for not pandering to the demands of others. It would be another four years before the release of another Kraftwerk album, although The Mix (released in 1991) wasn't an album of brand new material, but remixes of already released tracks. It was commercially successful, though, with the remix of The Robots reaching #20 in the UK and the album itself peaking at #15.